Bournemouth, Poole, Christchurch, Ringwood and surrounding areas. 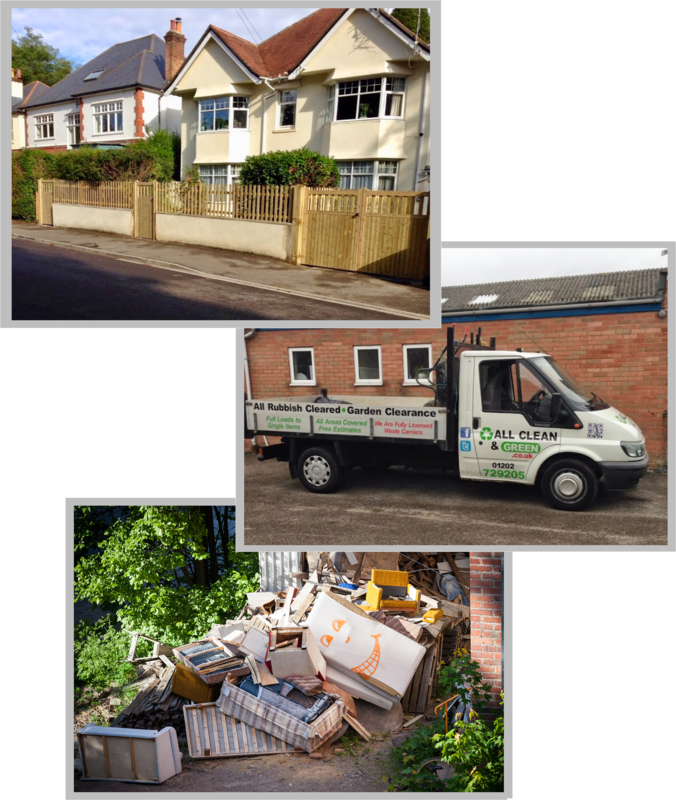 We are your local licensed waste carriers that pick up and dispose of your waste responsibly throughout Dorset. Our reputation is very important to us, this is why we always do our best to ensure 100% customer satisfaction on all projects. We will be happy to discuss any requirements you may have, our services are available at affordable prices. Contact us today! We are your local clearance company based in Bournemouth and Poole offering our services to both domestic and commercial customers. Our services are designed to provide a cost effective, flexible and environmentally friendly. We aim to recycle wherever possible and take reusable items to registered recycling centres. As licensed waste carriers, we can pick up and dispose of all your waste responsibly. We are equipped to clear a garden back to bare earth and are the cheapest around - available 7 days a week. We understand how easy it can be to have junk start to pile up over time, so whether you have few items to dispose of or an entire house, garage or office, we are the company for you. No job is too big or small here at All Clean & Green. We are not only cheaper than hiring a skip but are much more environmentally friendly, if we can't redistribute, we will strip old furniture down and recycle it all appropriately. Here at All Clean & Green, we believe that getting your house cleared should never be a challenge and therefore aim to provide a stress free service, offering 100% customer satisfaction and peace of mind. We clear and remove almost all types of waste from single items, a full house or office clearance. If you need rubbish taken from inside your home, our team will take on stairs, cellars and lofts to ensure that your property is cleared of any unwanted junk. Alongside all of our clearance services we can also over a bespoke Garden Maintenance service; from the installation of a new driveway to fencing repairs. All of our services have been designed to be helpful, professional and cost effective for our customers. With many years experience within the industry our team of highly skilled workmen only use quality materials for all projects we undertake, working within your budget to improve your property aesthetically as well as it’s value. Whether you require a new driveway or need to replace an existing drive, an installation of a new fence around your garden or even a property or office clearance, no job is too big or small for us.